Below are the cost of internet services provided by these two mobile carriers. Digicel Tonga is a mobile carrier in Tonga and offers Internet rates to customers on its network. There are two categories. 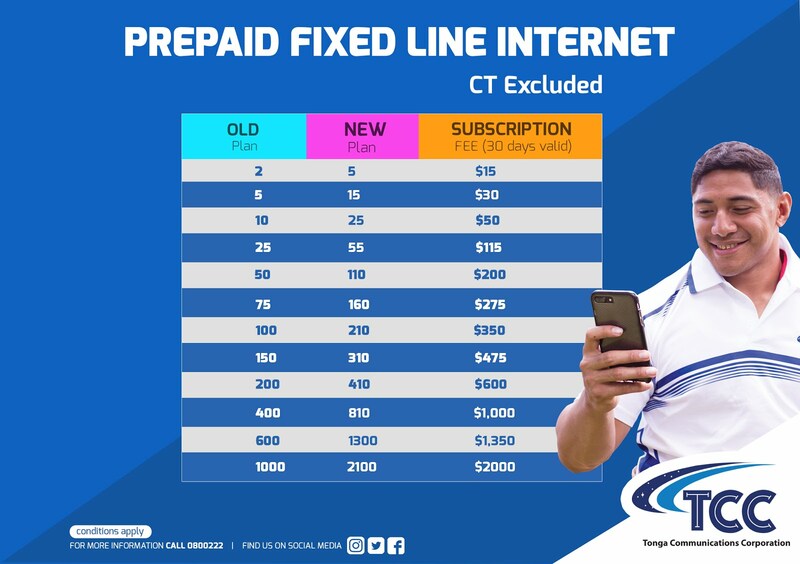 Prepaid and PostPaid data plans. What are the new roaming bundle plans? 3. How do I purchase this NEW ROAMING BUNDLE Plan if I go overseas? Firstly, contact our Customer Care team on 123 and request that your Digicel number be activated to roaming Top up, then *123# SEND and follow below steps below when you’re overseas. 4. Is the NEW ROAMING BUNDLE plan available for post-paid customers as well? NO – This New Roaming Bundle plan is ONLY available for prepaid customers only. 5. Will I still get the FREE 3hours call home bundle? NO – there will be no more FREE minutes for seasonal workers in Australia. The only option for them to call back home is buying a roaming plan. Roaming Bundle will available for ALL roamers / roaming customers. Tonga Communication Corporation offers broadband internet Services through their landline. They also offer wireless (wifi,) internet services. . They have postpaid and prepaid plans. See the graphics below. If you are a visitor and staying in Tonga for a short period of time, we recommend using Digicel Internet as you can access internet on your mobile phones. Residents can resort to have internet services through TCC. Digicel offers good promotions like unlimited data and voice calls. Note: This pages is updated frequently, so do visit the page again for further updates. In our next posts, we will look at cost of VOICE calls for both domestic and international for both networks.